For our Chinese New Year dinner, my friend Robert prepared this dish. It’s a very flavorful vegetarian friendly dish and something that can be made quickly. – Cut your tofu into small cubes. – Heat a splash of your cooking oil of choice in the skillet. – After the oil is heated enough, toss in the tofu strips. Let them brown a little. Make sure you turn them and flip them so they brown evenly. – Use a vegetable peeler on your carrots and make ribbons. – Chop the bok choy into edible pieces. – Fry the vermicelli in the oil when the tofu is just about done. Leave the tofu in while you fry the vermicelli. This will take about 30 seconds. Don’t burn the noodles! – Toss in the broccoli, with about 2 spoons of water, in with the noodles and tofu. – Cover and let it cook for about 3-4 minutes. – While your skillet is cooking, whisk together the peanut butter and chili flakes with a tablespoon of water. – Pour your sauce into the skillet and toss until everything is coated. Let it cook for 1-2 more minutes. For my Chinese New Year Dinner, my friend Yumi prepared this Ming Tsai dish. It’s a wonderful fried rice recipe that is as easy as it comes! The ingredients include common items with the exception of Chinese Sausage. If you don’t have Chinese sausage available, you can use bacon or even ham (which is what was used here). Heat a wok or large nonstick skillet over high heat. Add 2 tablespoons of the oil and swirl to coat the pan. When the oil shimmers, add the eggs, which will puff up. Allow to set about 5 seconds, and using a wok spatula or similiar tool, add push the sides of the egg mass towards the tender to allow uncooked egg to reach the pan and solidify. Flip the egg, allow it to set about 5 seconds, and slide it onto a dish; do not over cook. With the edge of the spatula, break the eggs into small pieces. Set aside. Add the remaining 2 tablespoons of the oil to the wok and swirl to coat the pan. when the oil shimmers, add the garlic and ginger and stir fry until soft, about 2 minutes. Add the la chang or bacon, the white parts of the scallions, and the rice. Toss thoroughly until heated through. Add the soy sauce, pepper, and reserved eggs and toss. Season to taste with salt and pepper; transfer to a platter and garnish with the scallion greens. 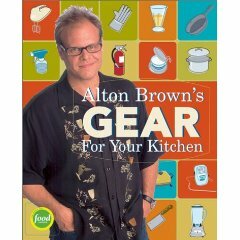 Winner of Foodie Freebie Friday: Alton Brown’s Good Eats! Foodie Freebie Friday is here! It’s already been a long day for me, after a 2 hour commute into work – one way. But thankfully I’m now in the warmth of the office and trying to thaw from the winter cold up here in Chicago. So there I am, immediately behind Alton, pretending to look at this knife display… as if it was more interesting than speaking to Alton himself. Alton turns around and looks at me apologetically. “Oh, I’m sorry. I didn’t mean to get in the way of the display,” says Alton. “Oh no worries. I was curious about this line of Shun knives. Do you have a preference in a specific Shun line of knives?,” I replied. Congratulations Linda and Matthew! An email has been sent to you to confirm your mailing address so your package can be mailed out today. Thanks to all those that commented and stay tuned to the next Foodie Freebie announcement on Monday, January 19, 2009! You won’t want to miss the next one, especially if you love to bake! We like Mexican food but sometimes it can be hard to jazz it up. While looking through various cookbooks and websites for ideas, I decided to give this recipe a try and serve it along side of corn tortillas. You could serve this as is with rice or even pasta, but I liked that we used this dish and filled our tortillas with something warm and cheesy. MIX soup, salsa, water, corn and beans in 2-qt. shallow baking dish. Top with chicken and sprinkle with paprika. Cover. BAKE at 350°F. for 45 min. or until done. Sprinkle with cheese. SERVE by slicing chicken and stuffing in warmed corn tortillas. The winter weather has me craving hearty pasta dishes. With quite a few tomatoes on hand, it was apparent that it was time for me to make some homemade pasta sauce to freeze. I decided on a pasta dish involving a bolognese sauce because of the richness of flavors and texture it has. That lead me to this recipe from Gourmet which combines bolognese with layers of spinach and bechamel sauce. The original recipe makes a full 9×12 pan of lasagna but I halved the recipe and baked my lasagna in a standard loaf pan. This prevents us from having lasagna for days on end and I like a thick & tall lasagna better than a wide & short one! Rather than using a stick of butter, I used 1/4 cup each of canola oil and extra virgin olive oil. It resulted in a very moist and tender crumb. In place of cilantro, I used two stalks of green onions, sliced thin (green part only.) The onion seemed to work well with the peppers and gave more to the overall southwestern flavor. Finally, the cheese lover in me thought it best to top these muffins with a Mexican blend of cheese. It added a nice golden color and slight crispness to the muffin top. Yum! Be sure to check out the other fabulous foodies who made this week’s Tuesdays with Dorie recipe, Savory Corn & Pepper Muffins. Interested in the recipe? Check out Rebecca from Ezra Poundcake who has the recipe on her blog or page 6 of Dorie Greenspan’s book, Baking from My Home to Yours.